Famished First Year - Family Times is an award-winning magazine with staff-written news, feature stories and artwork that inform and inspire Central New York parents and their children. Can new college students eat healthily? Each fall, we send our young adults off to college to gain an education, expand their circle of friends, and grow their life experiences. But the first thing many of them gain is weight—about 15 pounds, on average. Anthony Hinkelman, 21, of Syracuse, a junior at Le Moyne College, had a problem as a freshman, with the temptation of all-hours cafeteria buffets and the unhealthy food they offered. “I started out by heading straight to the salad bar, but that got old,” Hinkelman says. 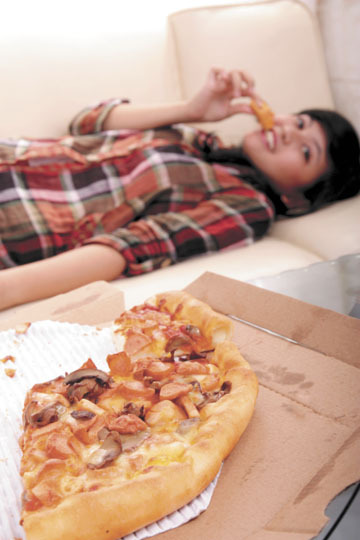 “And because I was still hungry, I would end up eating greasy food like pizza late at night.” For a moderately active young person with a healthy metabolism, pizza or other fast food won’t pack on the weight—unless, of course, it becomes a daily habit. When my own daughter, Rachel, went off to college at SUNY Geneseo, she gained nearly 25 pounds during her freshman year. Like Anthony, she holds the readily available buffets accountable, along with not having her mother around to tell her what she should eat and when. “For about $5, I could eat anything I wanted,” Rachel says, “so I would have a salad with some creamy dressing, then would try the pasta, but it wasn’t as good as what I was used to getting at home, so I also tried a bit of the hot entrée of the day.” Partaking of all the buffet offered made her feel greedy but she didn’t really enjoy any of it. With no bedtime, no one cooking a balanced meal, and the nightlife in the first-year dorm, Rachel ended up snacking throughout the day and into the night. In high school, she had been in sports year-round; in college, the sudden switch to a sedentary lifestyle took a toll. And there were other factors that led to weight gain. “Stress causes you to make bad decisions,” says Hinkelman. Rachel agrees that adjusting to college life, missing family and friends, and managing a strenuous course load can cause students to comfort themselves with food. However, college freshmen don’t have to let the environment determine their eating habits. And if they start off on the wrong foot, they can assess and change direction. Hinkelman recognized that he was in control of his eating habits and began to apply what he was reading about in books like Michael Pollan’s The Omnivore’s Dilemma: A Natural History of Four Meals (Penguin; $16). “Because a bunch of my friends were either vegetarians or vegans, I ended up becoming a vegetarian,” he says. Now Hinkelman’s diet centers on rice and beans—the gorgeous combination that provides protein and carbohydrates in a way that brings out the best of both. He also incorporates as many vegetables as possible into each meal by mixing and matching with foods like rice and pasta. He still indulges in the occasional late-night gooey cheese pizza but also has started jogging and lifting weights. Rachel started running for exercise, began to watch portion size, and avoided the buffets entirely. She chose foods such as “build your own” sandwiches, olive oil and vinegar dressing for salads and fresh vegetables. Above all, she scheduled food breaks so that she didn’t become famished and automatically reach for cookies or chips. Parents can help their young-adult children head off to college by giving them information to help make good food choices, avoid overeating and establish sound habits that will last a lifetime. However, we also know that sometimes the best lessons are the ones you have to learn the hard way. Long the staple of college dorms, ramen noodles are only high in sodium and fat when you use the seasoning packet. Throw out the packet and enjoy this filling and healthy dish. All you need is a micro-fridge and a trip to the grocery store. Heat water to boiling in microwave or use a hot pot. Immerse noodles in hot water and let soak for 2 minutes. Pour off all but ½ cup of liquid and add a handful or two of coleslaw mix, a tablespoonful of peanut butter, a squirt or two of chili-garlic sauce and a squeeze of lime juice. Stir well and enjoy! Makes a great breakfast or a fine quick lunch. With just a couple of minutes in preparation time, it works even when you’re running late for class. Microwave sliced mushrooms on high for 30 seconds on a paper towel. Meanwhile, beat the eggs in 1 quart glass mixing bowl with a fork or wire whisk. Add butter or oil, cooked mushrooms, and salt and pepper to taste, then mix with spatula. Cook for 75 seconds at full power. Mix with spatula and dig in. You can also put it between two slices of soft bread for a meal on the go. You can cook rice in a microwave in about 10 minutes and combine it with a few fresh vegetables or a bagged salad for a real meal that will fill you up at very little cost. There’s nothing “lean” about this dip, but it is easy to make and will keep the calories in check (when shared among eight people, calories are just over 200 each). In the bottom of a 9-inch microwave-safe glass dish, spread the cream cheese. Top cream cheese with an even layer of chili. Sprinkle cheddar cheese over chili. Heat in microwave on high for 5 minutes or until the cheese has melted. Serve with tortilla chips or pita chips.